It may be a bit premature, but I have Christmas on the brain. We've been playing Christmas music since November 1 in our little jewelry studio. While I am very excited for Thanksgiving next week, we don't really do Thanksgiving decorations so I keep thinking about Christmas decorations. I don't have mine up yet, so you don't have to get all bothered and bunched up about that. But I photographed a wedding recently that had some gorgeous Christmas decor up and I loved this idea so I wanted to show you. It was a sideboard table or buffet type piece of furniture, with a mirror back. On it, there were lots of rows of white lights. Over the white lights was several layers of glittery tulle. 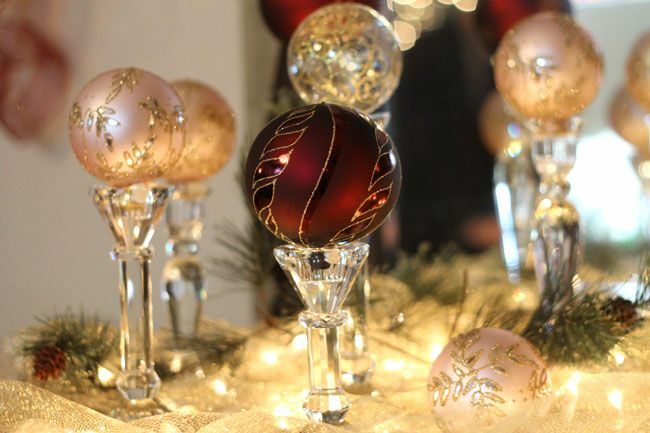 And then vintage crystal candlesticks with ornaments turned upside down on them. It was so sparkly and beautiful! Such an easy little thing to do, but wow did it make a big impact in the room! Talk to me: Do you have Christmas decor up yet? Are you thinking of any yet? Or are you annoyed with people like me who get excited for Christmas before Thanksgiving? This is so beautiful Beki!!! No - I don't get annoyed - as long as you don't ask me to decorate for Christmas yet. With the exception of perhaps a front door wreath, nothing Christmas goes up at our house until the day after Christmas. ...and speaking of a wreath, this year, I'll have to buy a new one since last year's got filled with two muddy bird's nests! I have to say that I tend to get annoyed. :-( I LOVE fall and everything about it and hate that it gets totally jipped for Christmas. I tend to like Thanksgiving more because I feel like it's a GENUINE holiday in regard to emotions and feelings of giving, festivity and cheer. I hate that Christmas has become so commercial and focused around GIFTS rather than Christ. :-) So...bring on the TURKEY DAY!!! I have a pair of unused crystal candle sticks, from our long ago wedding, that I am going to do this with. Brilliant. 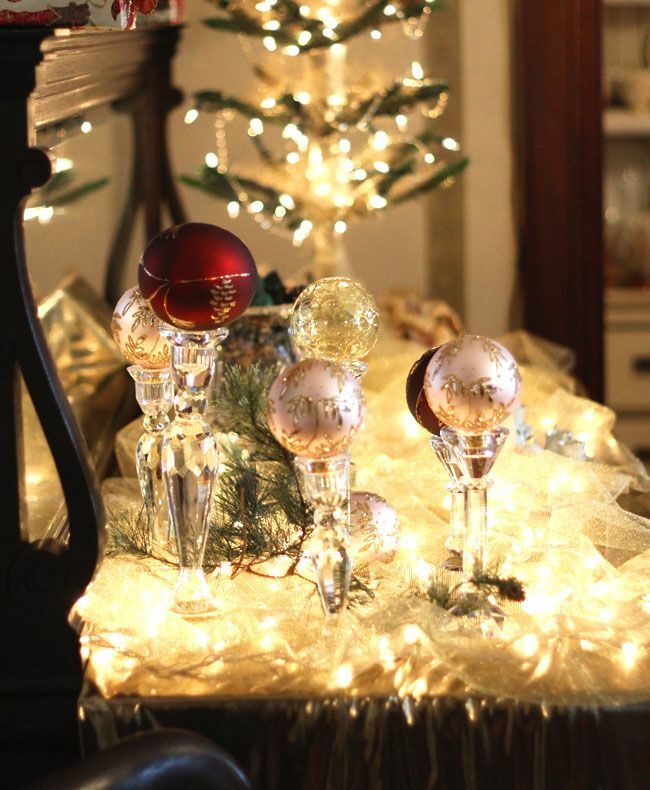 I think now is the time to share ideas so when it is the appropriate time to decorate one is prepared. So, 2 thumbs up for your sharing and enthusiasm and total relief that you haven't decorated yet. I haven't decorated yet, but I have already started shopping and collecting supplies for new decorations and projects. I am so excited, and I will be decking the halls big time the day after Thanksgiving. My daughter is at a great age to help and enjoy all the decorations this year! keep in mind...I don't have a jewelry/gift giving business...you need to have Christmas on your mind! What a besutiful display.. I love it, thanks for sharing....I don't have any decor up yet.. usually wait until the day after Thanksgiving, but this year is crazy.. we are currently staying with family while we look for a place to rent.. so it feels like my life is on hold until we get somewhere! I love Christmas, its my favorite time of the year! Ummm. I meant the day after Thanksgiving. Oh, my. Decorating the day after Christmas is just silly! I just saw these on Pinterest! But I tend to listen to it "later" rather than "earlier"...meaning, I listen to it into January...I just enjoy the Fall season too much to rush it! I have a litty bitty shop to decorate, so I have to start thinking about Christmas decor way "ahead of time." I just love it. Love, love, love! Plus, it's snowing. Scarecrows and dried leaves don't really take well to snow. So so pretty and shiney and sparkly. I can't wait to decorate for Christmas!! !